History: Stiles is a crossroads town north of Big Lake Texas in Reagan County. It is described in T. Lindsay Baker's "Ghost Towns of Texas". I remember seeing the big Jacobs wind generator sitting on top of a 60 ft. tower near the home of a widow lady who lived in one of the few occupied houses in Stiles. There was a shack near the tower and I looked around in there and saw a stack of old glass batteries, wires, and a control box. The purpose of all of this was to supply the lady's house with lights and, I am guessing, probably a refrigerator and a radio. I don't know if I ever saw a Jacobs before. There was a more common smaller brand called the Windcharger. I have since learned that the Jacobs was referred to as the Cadillac of wind generators. It must have been 1971 or 1972, before we moved to Alabama, when I was standing there gazing up at the thing while my father was considering how he was going to take it down. A 60 ft tower is taller than he was used to dealing with. Jacobs Wind, From Wikipedia, the free encyclopedia. 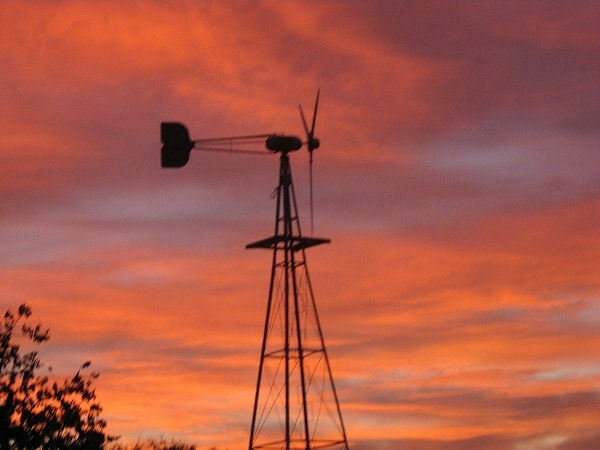 Jacobs Wind Electric Co. Inc. is the oldest small wind turbine company in the United States. It has been designing consumer wind systems sized to the changing distributed electric loads of their periods since the mid 1920s. The firm was started by Marcellus and Joseph Jacobs, after local interest in their wind electric system for their family's Montana Ranch, built in 1922, brought them requests from neighbors to provide them with wind generated electric power as well. M.L. & Joe moved the firm to Minneapolis in 1931 to begin production of improved wind/engine distributed energy systems which were sold in the U.S., Canada, and Mexico, as well as on every major continent, through a Dealer network that grew to over 300. Early Jacobs' machines included one taken to Antarctica by Richard Evelyn Byrd and installed in 1933, running until 1955. 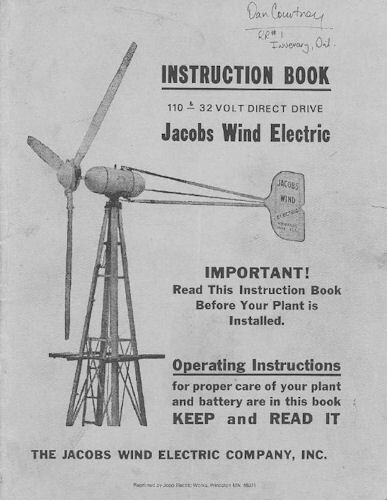 Before production ceased in the late 1950s, about 20,000 Jacobs Wind Energy Systems (1 - 3 kW) were shipped from Minneapolis. But he did take it down for her because someone wanted to buy the tower. We were living in the old house on White farm in Opelika Alabama when Dad called and said that the lady wanted to sell the Jacobs for $400 - do I want to buy it? Oh yes! I knew that it was worth much more than that. 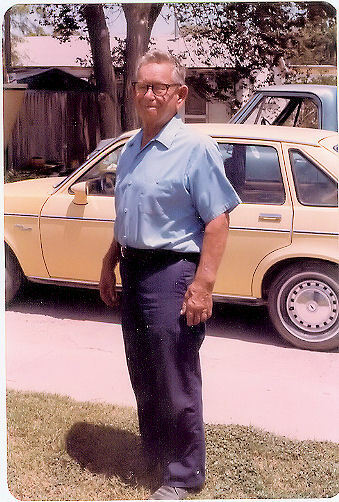 The Jake (common nickname) arrived on a truck and the driver unloaded the blades,hub,tail and other parts which were packaged in crates that Dad had built. I put it all in the barn except the turbine itself which was too heavy for me to move. And there it sat on the ground for many years as my ambitions toward putting it up faded and as I learned that it would be hopeless since the wind just does not blow nearly as much in Alabama as it does in my native West Texas. After we built our house in Opelika in 1976 and were settled in, I found some way to get the turbine into my pickup and move it to my carport. I remember that I once connected a voltmeter to it, wound a rope around the shaft and pulled. I was pleased to see the voltmeter register a few volts indicating that the old Jake was indeed, alive. As the years went by, many people asked us what that thing was lying there in the carport. After we retired and were moving our things to our new home in San Marcos, Texas, the time came to get the old Jake into the rental truck. I imposed upon some of my friends and they helped me pull it up the ramp into the truck. And then, of course more friends had to help with the unloading in San Marcos. I am forever grateful to these people who love to remind me of their physical sacrifice. I have always estimated the weight at 400 lbs. There is an awful lot of copper in there. The year was 2001. Now the old Jake is back in Texas where it belongs but it is lying there in the new carport. I thought about selling it and contacted a man who is an expert on Jacobs Wind Generators. He asked me if the blades are in good condition. I said that they were and he said that the thing would be worth 4 or 5 thousand dollars. So, it was worth more than I thought but somehow, that news inspired me more toward getting it running rather than toward turning a profit. I don't think my dad, who had left us in 1987 would have been pleased if I had just sold it. And besides, I have always had in mind that this whole project should be dedicated to him. I started replacing some bolts and cleaning the dirtdobber nests out of it and moved it into the shop and placed it up on a stand. That first picture which shows me moving the Jake into the shop was taken on Jan 30, 2007. That was when the real work began. Now somewhere along the line I managed to obtain an owner's manual. Restoration: I did everything I could think of to make sure that all the parts were cleaned up and in working condition, brushes, commutators, bearings, nuts and bolts. The tail support was broken in one place and had to be welded. There was a box of bolts that dad had sent along with the other stuff and when it came time put the hub in place I did not find the big nut which holds it on. I thought that it was a size 7/8 inch and I had a hard time finding one. After I did, I was very shocked to find that the 7/8 inch nut was just a tiny bit too small. I had to go to a machinist and have the non standard nut made. This cost me $200. The machinist told me that factories in those days would make things like nuts and bolts whatever size they needed - no standard sizes. Then there was the big turntable bearing which the turbine sits on at the top of the tower. I did not have the tools to take it apart. So I took it to an auto mechanic to have it taken apart, reassembled and greased. All of the grease in all of the bearings was caked and hardened. The blades are made of wood, California sitka spruce. This is the one part which is pretty much impossible to replace. The surfaces were weathered and most of the paint was gone. I took one of them to a local paint store and the man there directed me to another store in San Antonio which specializes in restorations such as mine. This is the store you go to if you want to work on your wooden airplane propellers, for example. Sure enough, the man there took a look at my blade and started rattling off instructions. Diane had to take a page of notes as he went through all the details about filling, sanding, spray painting different layers (don't even think about using a brush), which sand paper to use between layers and a load of details. We left the store with the spray nozzle, fillers, cans of chemicals and paint, three kinds of sandpaper and instructions. One of the blades had a bullet hole a few inches from the tip and the wood was split from there to the tip. I managed to force the crack open enough to force some glue in there and then fill the hole. As I got into the refinishing I noticed there was also a place which looked like the blade had been shot with a shotgun or bird shot. I even found one pellet imbedded in the wood. So I laid out the blades in the order that they came off the hub and discovered that they had been shot twice. There was one set of parallel scratches and then another set of parallel scratches at a different angle. I did the best I could to put a good finish on the blades after all the filling and sanding. Then I could worry about balancing. Vibration from unbalanced blades can be a real problem. There were some lead weights near the hub end of the blades which had no doubt been placed there for balancing purposes when they left the factory 60(?) years ago. By adjusting the weights I did my best to make the three blades weigh the same and balance at the same distance from the hub end. 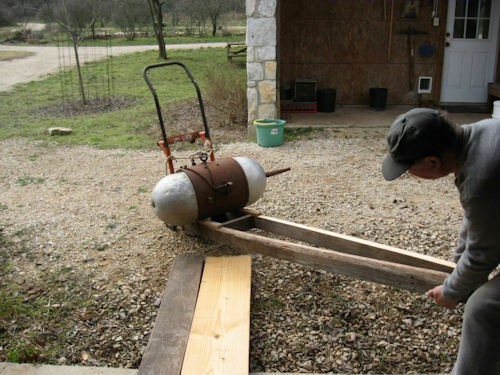 The old Jake is a direct current (d.c.) generator. It does not have permanent magnets inside but has, instead, field coil electromagnets. It has to be connected to batteries to operate but when it is connected to batteries it is a motor as well as a generator. In the old days it had a control box (called the "master mind". I have the remnants.) 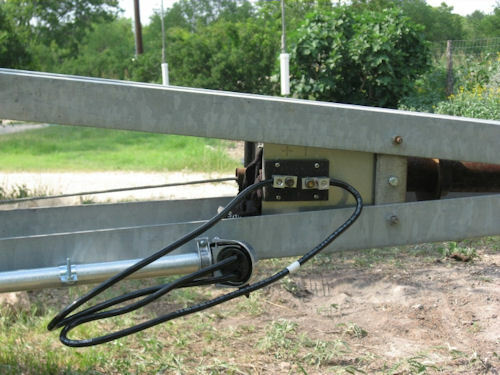 which would automatically cut off the power to the field magnets when the wind slowed and the voltage dropped to a certain level. Otherwise, the unit would keep turning as a motor and run down the batteries. That old technology is now replaced by one big diode. A diode allows the current to run in only one direction. I learned all this from a gentleman in Minnesota who is the expert on wind generators. 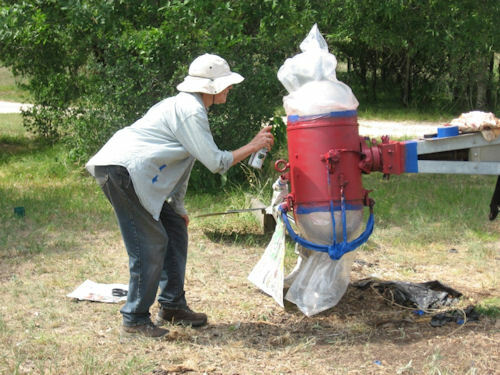 He instructed me on how to wire the field coils directly and put the 300 volt diode between the turbine and the battery. I did this while the jake was in the shop and was thrilled to see that it would turn when connected to a battery and would not turn when the diode was installed. Now I knew how to wire the thing! The biggest challenge was presented by a very important missing part. There is the tube - I call it the mast - which extends down from the turbine into the upper part of the tower. It has three copper rings (I will only need two) where the current is picked up from the turbine and carried to the batteries. There is supposed to be a cast iron box bolted to the tower legs which contains a bearing holding the mast in place and a collector. I did not have it. I suspect that the guy who bought the tower 35 years ago has got it. I found a bearing that I could use but I had to build my own collector. 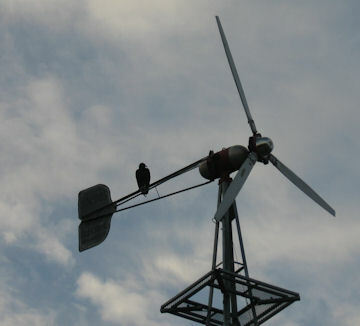 The collector is the gadget which holds brushes in place which pick up the current from the turbine as the turbine turns with the changing directions of the wind. I bought some brushes and mounts which were intended for use in a 12 volt d.c. winch, the kind that mounts on the front bumper of a truck. Then I made a frame from a plastic cutting board (it insulates!) and treated wood and aluminum. The wires are connected to my home made collector and run through a weather head and down the tower to the ground. After the Jake had been up and running for a few days, the current stopped flowing. I climbed up the tower and found that the grease in the bearing above it had sort of liquefied and ran down on the rings and gummed everything up. I cleaned it up and put something in place that I hope will keep it from happening again. And then there was the cutoff. Originally, there was a chain which ran through the mast and over a pulley and attached to the tail. When the chain is pulled downward, the tail is pulled into position perpendicular to the plane of the blades thus turning the Jake on. The chain was broken and I could not find a replacement that I was happy with. Someone suggested 3/16th inch cable. I found the perfect crank at Tractor Supply and bought enough cable to do the job. I had to replace the pulley with a larger one because the cable would not bend over the smaller one designed for the chain. It worked. I thought that I would just look around for a tower. There are plenty of old abandoned windmill towers and I knew that I could buy one and then maybe just add another 20 feet to it. But all the old towers I looked at were just too rusty and bent up. I went to the local windmill man and inquired about the cost of a new 40 ft tower from the Aermotor Company. The cost was a bit of a shock. And the top portion, the stub, had to be changed to fit the Jake's turntable bearing. I had to pay for that work, a nice platform and the installation. In the end, the tower was the most expensive part. The tower, without the platform, was assembled and arrived on a trailer along with a crane, a drill and a crew of men who got the thing up and anchored in place in a remarkably short time. 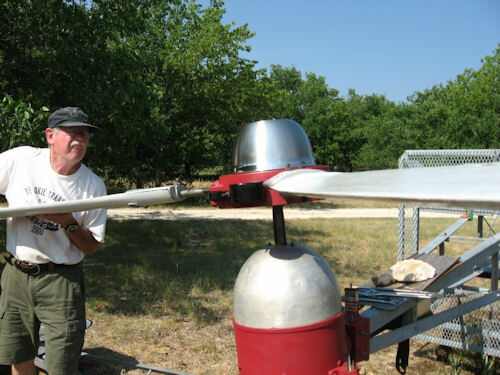 Later, I had them come back and take it down and install the turbine in place. That was when I was able to work on the collector and cutoff. I would say that most of these old wind turbines are installed off grid and mostly by people who live too far from the grid. I knew that I could never get enough power from mine to power our modern house and so I planned to hook it to the grid. In either case you must have an inverter and hooking to the grid requires an expensive sine wave inverter. 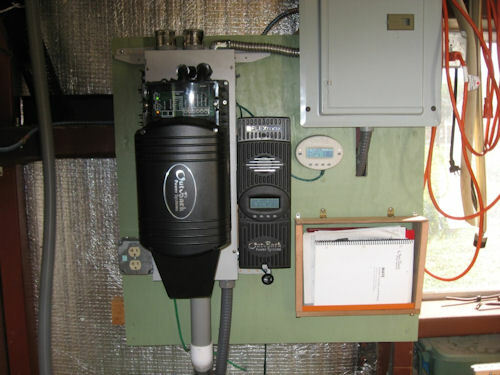 I researched the equipment and companies and settled on the Outback Company for my inverter and controller. This is the part of the process that I know I am not qualified to do by myself but there are companies which install solar equipment and they are doing a grand business. 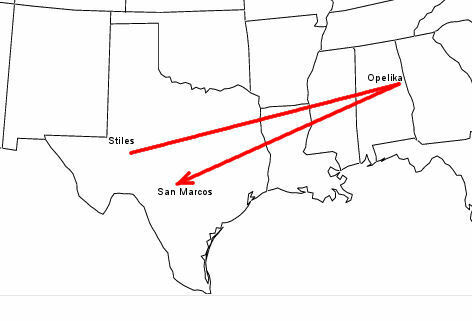 The first company I went to was in Austin and they outlined a plan. They did not give me an estimate of the cost but did ask me if I would like to go ahead and buy the inverter. I did buy it from them and then they never answered my phone calls again. The boss was out of the office every single time I called after he cashed my check. I went to another solar company in Austin and had better luck. The man came to our house, drew up some plans and presented an estimate. I enjoyed being treated more decently but the estimate was just too high. I had to make the decision to try and do this myself. More research led me to a company which makes the panel which connects everything together and a supplier of the controller and other parts needed. I ordered these things online and they arrived along with instructions. Now I had to install breakers and lightening arrestors, a load circuit, and connect the controller with the right size wires. I hung a plywood wall in the shop to hold everything up and built an enclosure for the batteries. I called upon the help of a friend who is an electrician to run the wire down the tower and over to the shop. He wired in the diode and made the final connections. Except that the tower is still down and the d.c. connections can not be completed. Meanwhile, when I was finally finished wiring the panel, I lifted the 70 lb inverter into place on the panel and connected it to the batteries and the panel's a.c. side. I attached a Mate which is a little Outback computer which monitors the inverter and allows me to make the settings. Oh yes, I had to drive three 8 ft ground rods into the ground. They had to be angled so as to get a good ground attachment before hitting solid rock. All of that took a long time but now we got to do the fun part. I attached the tail, connected the cutoff cable, installed the hub (with the $200 nut), attached the home made nose cone, and put on those beautiful blades. Diane painted everything and it looked very nice and was ready to go up into the sky and catch the wind. And then came the Summer of 2009. The temperature went to 100 degrees 68 times and there was practically no rain. Why does this matter? 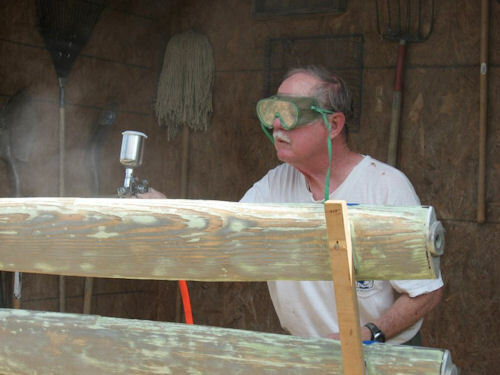 The windmill man was swamped with work. Wells were going dry and his men were working many hours a day. I was waiting for him and his crane to put the tower up but he could not work it in. He told me that if they had a job in my area, then maybe they could get to it. That was very frustrating but all we could do was wait. Months went by and finally, one day with no warning, the crane came rumbling up the driveway. The platform was installed, the crane lifted it up and the feet were bolted in place. The electrician made the last wire connection at the foot of the tower and connected to the a.c. service box in the shop. At last, it was time to turn everything on. I spent a lot of time reading the manuals. Each of the inverter, the controller and the Mate has a manual and almost everything in there is about solar applications. I did the best I could to understand the relevant parts of those and finally looked at the part about how to turn it on. I was a little jittery when I placed my hand on the main battery breaker and pulled it up. The inverter came to life. The l.e.d. lights came on and blinked as it went through an initiation program. The face of the Mate lit up. Then I turned on the breakers to the controller and it came to life. I made some voltage settings through the Mate to tell the inverter that is was to operate a 24 volt system and that it was to be connected to the grid. Then I closed the breaker to the grid and checked the readings on the Mate as instructed. There were no error messages. The inverter which is also a charger started to charge the batteries and brought them up to a predetermined voltage. I was thinking about my father when I walked out to the tower and turned the crank to let the old Jake unfold and start to turn. There was just enough wind to spin the blades enough to register some incoming current. That was good to see. Eventually, the battery voltage built up enough to switch the inverter into sell mode. That was even better to see. A buzzard visits. Well, sometimes the wind does not blow. A few days later a cold front rolled in and the wind was strong all day long. I spent some quality time in the shop watching the settings as the inverter sold 4.2 KWH of power. I went out to the meter and finally saw what I wanted to see - my meter was turning backwards. 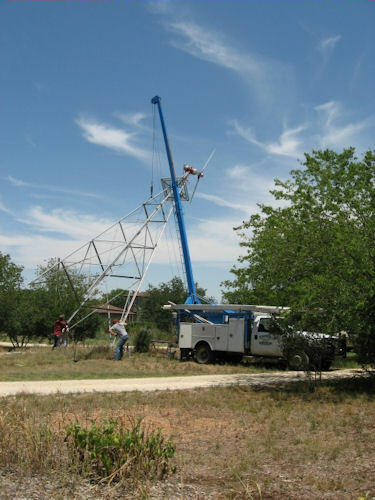 We now have a contract with our electrical supplier, the Pedernales Electric Cooperative, designating us as suppliers. It is doubtful that the Jake will ever produce enough power in a month to cause the P.E.C. to have to pay us for supply. I still have to connect a diversion load to protect the batteries. And one other thing; I have a pile of receipts in a file that I have to add up to see how much all this cost. I don't want to do that.